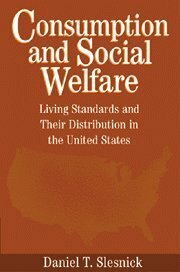 Consumption And Social Welfare: Living Standards And Their Distribution In The United States: 9780521497206 Hardcover - LIMEROCK BOOKS INC. The most widely-cited social welfare statistics in the United States are based on tabulations on family income. The picture that emerges is cause for concern; median family income has hardly changed over the past 25 years while inequality has increased and poverty remained persistently high. Yet, consumption-based statistics as employed in this work yield rigorous and quite different estimates of real individual and social welfare. Closely linked to economic theory, Professor Slesnick's examination of standards of living, inequality, and poverty reveal that the standard of U.S. living has grown significantly while inequality and poverty have decreased to relatively low levels. His assessment is drawn from extended period data in order to chart long-run trends. The most widely-cited social welfare statistics in the United States are based on tabulations on family income. The picture that emerges is cause for concern; median family income has hardly changed over the last 25 years while inequality has increased and poverty remained persistently high. Closely linked to economic theory, Professor Slesnick's examination of standards of living, inequality, and poverty reveal that the standard of living has grown significantly while inequality and poverty have decreased to relatively low levels.